Kitchen Area Rugs – A new trend in interior design is taking kitchens by storm, and it’s probably going on right under your very feet. Large kitchen rugs are great ways to add color, patterns, and overall design to an otherwise barren space. Picking out good kitchen area rugs is all about balance, do you need something functional or are you looking for the right decorative piece that will make your kitchen pop? From ergonomic designs, to stain resistant technology, We’ve got the down low on everything you’re going to need to pick out the right large kitchen rugs for you. Why Use Large Kitchen Rugs in the First Place? Kitchen area rugs have been building in popularity for the last few years. First of all, they look great. Well placed kitchen area rugs can give a high foot traffic area your own personal touch — it’s hard to find kitchen accents that are as subtle while still being effective. It’s why it’s a go-to move for many interior designers. Large kitchen rugs are also great on a practical level. Many are stain resistant, easy to wash in a washing machine, and have great ergonomic designs. That means that you can feel free to cook with them underfoot knowing that they’ll catch a lot of your mess ups, are easy to clean, and won’t give you foot fatigue if you’re on feet all day. They can offer a class alternative to bulky, ugly door mats and the use of natural fibers like wool means that they can offer a cleaner alternative than using traditional full carpets in a messy space like the kitchen. As with anything, it’s important to explore your own tastes and needs when figuring out which kitchen area rugs are right for your space. Don’t rush into anything, experiment with patterns and materials and be honest with yourself about how much you’ll have to wash them. 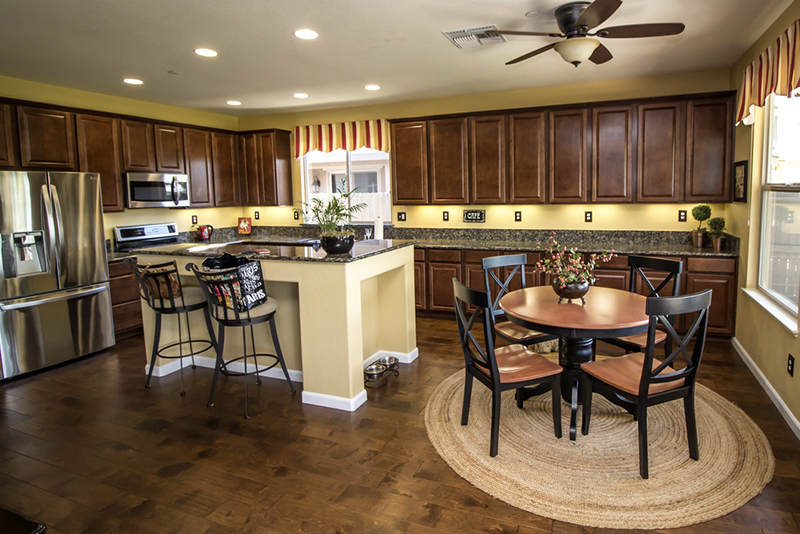 Here are some things to consider before pulling the trigger on large kitchen rugs. Kitchen area rugs come in a variety of styles and materials. The material can be one of the biggest considerations when figuring out which is right for you. Is this a high traffic area that will need a hearty rug? You might want to consider jute or sisal rugs, which have course, hearty fibers that are easy to spot clean and hold up under considerable wear and tear. These are often flat woven rugs that have simple patterns and colors. To clean a sisal rug, you just need water, a little soap, and a stiff brush. While these rugs aren’t the most comfortable to walk on with bare feet, the rug fibers are able to hold up to washing machines too, making them a good option for heavy use with minimal upkeep. Wool or traditional oriental rugs may need more care and probably won’t respond to stains in the same way. This is a good option if you’re looking for something decorative more than functional. These fibers often hold color well, setting off your flooring and adding to the kitchen design more than their heartier counterparts. Obviously, this isn’t a great choice if you have a ton of kids running around, spilling grape juice willy-nilly, but if you’re looking for a cool, grown-up choice for your new home, perhaps this is a better option. Plus, juice accidents happen with grownups too, we aren’t here to judge. The good and bad news is that kitchen area rugs come in an almost limitless amount of sizes and styles. The thing to help you narrow it down is to figure out the space that you’re using it in. 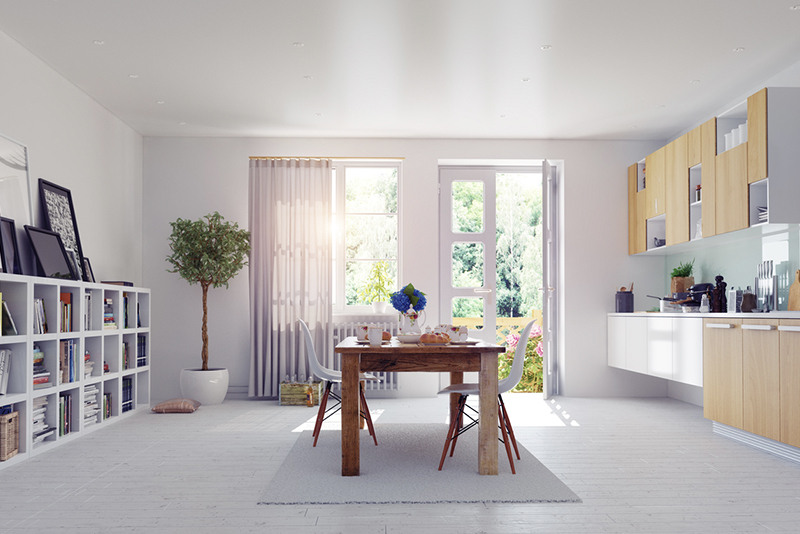 Is your kitchen modern minimalist with tons of floor space, natural lighting, cabinets, white and clean aesthetics? Then a modern design rug might be best for you. These rugs are heat resistant, work well with just one or two colors, and are able to adapt to a modern space without drawing too much attention away from the natural lighting and sleek designs. Maybe you have a large, sleek kitchen with a warm dining area and a formal aesthetic? 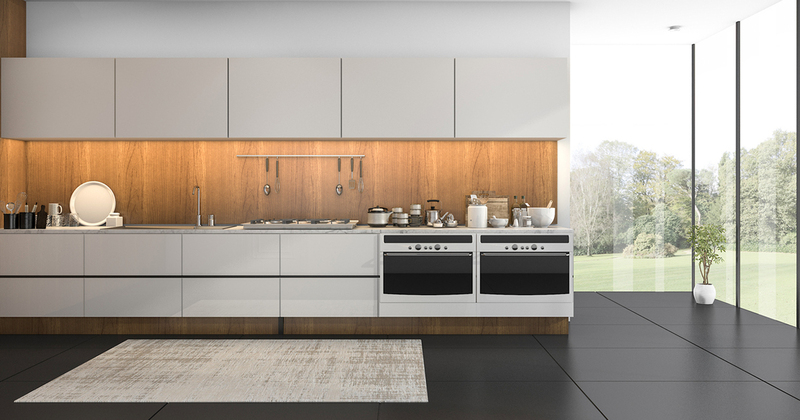 Something with cabinets white base coat, simple and elegant in design, classic and timeless? In this case, consider going with a French country rug. 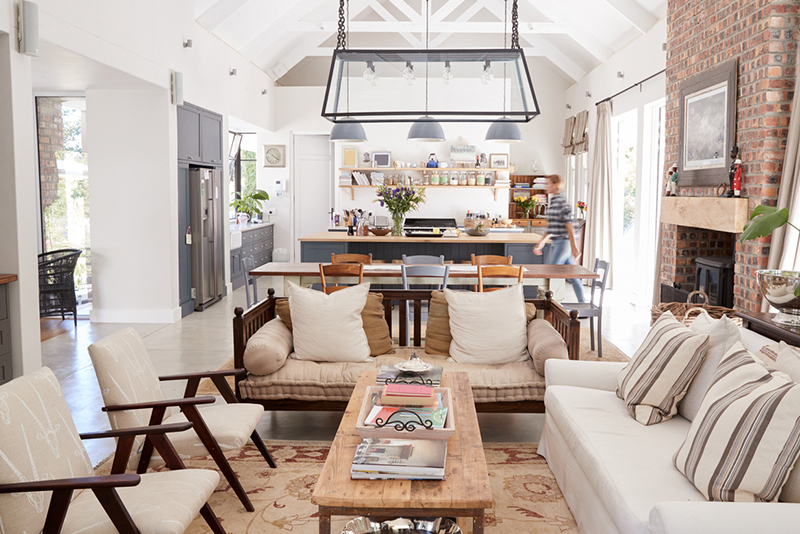 These often have ornate, beautiful designs and are typically large kitchen rugs that are able to cover a lot of area — say under a large dining room table. 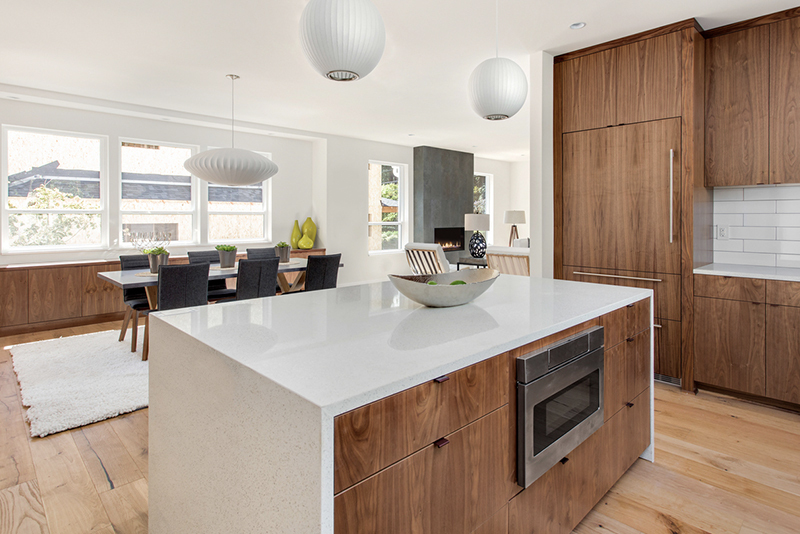 While they may not be the best option if you have a smallish kitchen with only a few feet (or inches) worth of room between appliances, it is the perfect option for a more opulent area. Beware that because of the material, these rugs can be prone to slipping. To prevent this, you can put a rubber mat beneath it. Make sure you measure out your floor space though, you don’t want to be caught with the wrong size and extra inches of material bunching up and causing accidents. 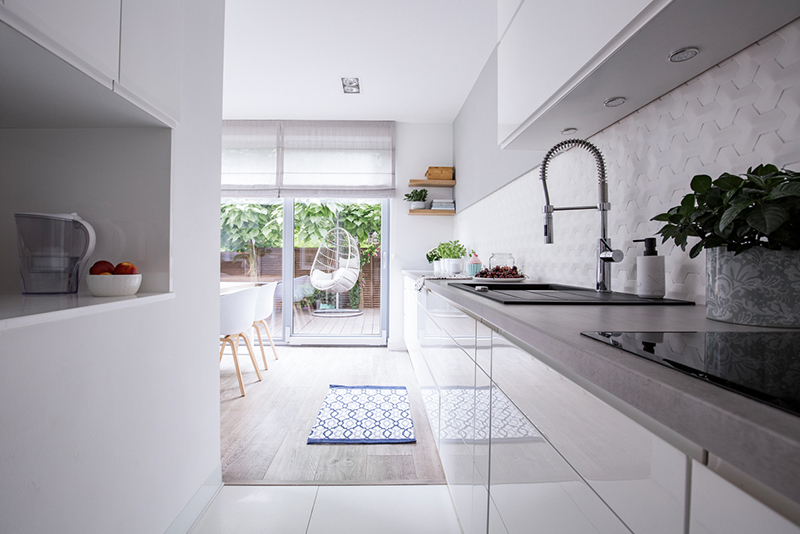 If you’ve got a smaller space, you may want to go with smaller, heartier rugs that can stand up to high traffic and repeated washings (they’re probably going to get dirtier in a small cooking space). If you stand while you cook, you’ll want it to be enhanced by memory foam, which can limit foot fatigue from large periods of time on your feet. Consider a circular rug with a flat woven pattern for your dining area, as this can be a great way to make the most of a smaller space. Here’s where it gets fun, thinking about the aesthetic of your house, your kitchen, and then how your large kitchen rugs can fit into those patterns. This is when you really can get artistic and unleash your inner interior designer (is that redundant? Inner interior designer?) 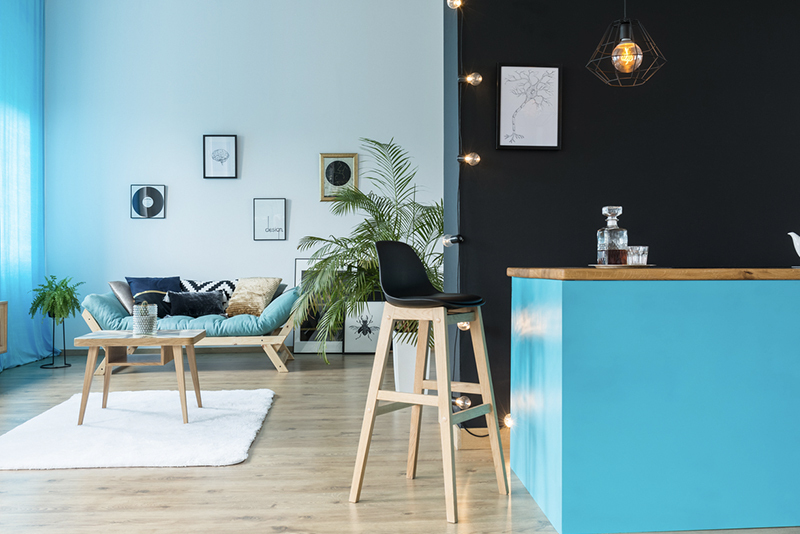 Play around with patterns and colors that work for you, that bring out the inner beauty of your wood floors, your bright base coat, and your other kitchen decor. Here are some ideas depending on the style of kitchen you have. If you’re going for the modern look: If you have high ceilings, tall windows, and plenty of natural light, you may want to go with a modern design kitchen rug. These are heavy-duty, minimalist designed rugs made from natural materials like jute or sisal. If you’re a household that has some, uh, accidents in the kitchen, then this is a great idea. It’s easy to clean a rug that’s from this category, with just a little soap, water, and a hard brush. Many are even washing machine friendly. Rugs modern in this fashion also have the benefit of having a simple color palette, making it ideal if you just have one or two simple spaces that you want to draw attention to. Some of these rugs are even knit modern, using nylon or other cutting-edge materials to give you great new looks and durability that was previously unheard of. If you want a homey space: If your kitchen is a place of warmth, camaraderie, and great food, then you may want to go with a farmhouse design rug. These are hearty rugs in subdued colors that usually have a simple design. Think the style that your parents (or even grandparents) might have used when designing their kitchen. They’re great at hiding spills and don’t need much in the way of upkeep. If you want that bohemian look: If you’re still in that funky, fun world of mismatched patterns and fun colors, then a shabby chic design might be the rug for you. Often these rugs have fun, international patterns, and colors, making them really pop. This is a great idea if you’ve got a smaller space and want to make it seem interesting. These rugs aren’t the most durable, but that’s ok, that’s sort of the shabby part of shabby chic. Just be careful, too many of these type of rugs in a space and it can feel too busy and like it’s an assault on the eyes. If you’ve got a Victorian-style Kitchen: Maybe you have a huge space with ornate designs, beautiful white base coats, and a roaring fire in the hearth. In that case, go with a classic french country rug or a farmhouse design rug. These large area rugs can tie a whole house together. Often using cream, blue, and other natural colors, these ornately designed rugs can stay true to the traditional look of a large rug. Think something out of George Washington’s house and you get the idea. This is a style that’s been around for hundreds of years, with good reason, it’s classic, hides stains, and can set off natural wood that other rugs can’t. Be warned though, these rugs are often very large, which make them not ideal if you don’t have a space that can handle them. Given the room though, these rugs are sure to be a talking point — without being too much of a distraction. Durability is an important feature for kitchen area rugs. Not only do you want them to not fray, you want them to prevent slipping, have great floor life, and prevent kitchen accidents from unwanted bunching. While size and design are often important components that are considered at the initial purchase, durability is something that often goes overlooked. It shouldn’t. Usually, these rugs are going to be in your house for years to come, keep them looking nice and it’s a great way to always have a fresh look. If they start to come apart though, it can give your house a Gray Gardens, abandoned vibe that will leave people thinking haunted house rather than inviting space. Here’s the good news: most modern rugs are flat woven from hearty fibers like sisal or industrial wool that are specifically designed to hold their shape and form for years. Not only that, they incorporate ergonomic designs with memory foam to make sure that you’re getting a hearty rug that’s fun to stand on for years to come. Traditional oriental rugs don’t have this heartiness, often made from soft, supple materials, these are the kind of rugs that are fun to dig your bare feet into but may not last a long time. With these rugs, it’s much more about comfort and design than it is about durability. That means they’re more suited to the kitchen than a high traffic area like a hallway. These are rugs that also need to be spot cleaned with a paper towel rather than thrown into a washing machine. If you don’t mind a little fragility though, these are beautiful pieces of art that you can put on your floor, elevating a rug from furniture to a conversation piece. No matter what you decide, it’s important to buy a rug that you’ll be happy with for years. There’s no pressure to get it right immediately, so take your time and find a rug that’s going to feel like a classic, not just to you, but to your kids (and maybe even your grandkids). Rugs are a great way to express your individuality and artistry, as well as give your kitchen a little TLC and stain management. Judge what’s important to you, and go from there. Whether it’s traditional, modern, or vintage, your rug is there to elevate your kitchen from simple kitchen decor and jute rugs to be something that can add to the vibe of your whole house. That’s a great thing! Feel empowered that no matter what, these are decisions that should be made with your happiness in mind. And you know what? You deserve it. A kitchen should be a restful, warm place where magic happens. Think about some of your strongest memories from childhood, I bet a lot of them happen in a kitchen. Make new memories that will last a lifetime, find the rugs that will bring you bliss. We know you’re going to love it. Happy shopping!